Proofs of a book that was published by Thomas Constable and Co., Edinburgh, 1849-1852. These proof sheets to the fourth and last volume (1852) of Hanna's 'Memoirs of the Life and Writings of Thomas Chalmers', derive from the Chalmers family through Mrs Anne Chalmers Bennet Clark, and are marked in manuscript at the head of the first page 'This Chapter has not [last word underlined] been sent out.' 24pp., 8vo. Three unbound signatures, paginated 439-462. In fair condition, aged and worn. 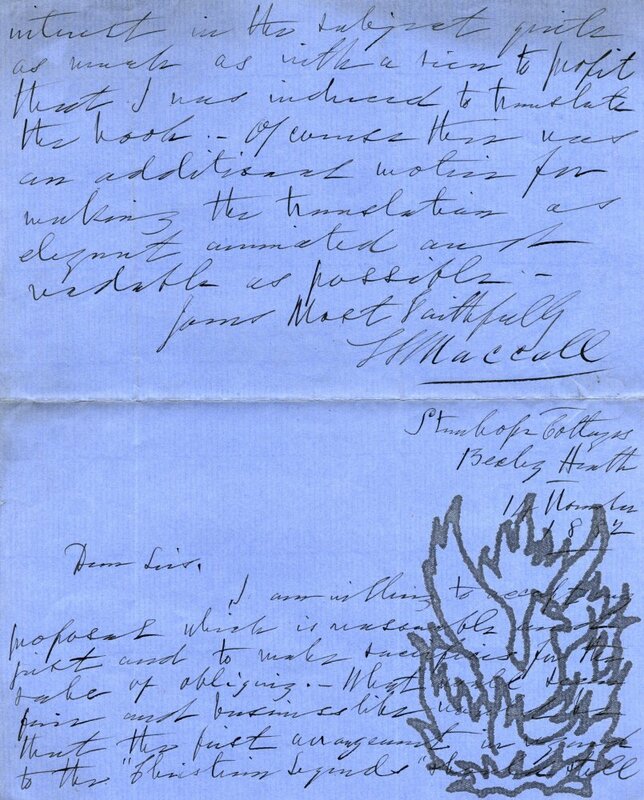 Autograph Letter Signed ('James Dodds'), to John Hunter, the Writer of the Signet and also friend of Carlyle and Leigh Hunt. James Dodds (1813-1874), friend of Carlyle and Leigh Hunt, Scottish lecturer and poet. 2 pages, 4to, good condition. 16pp., 8vo. Disbound. In fair condition, on lightly aged and worn paper. Steel engraved portrait of Carlyle on title-page. Clearly produced immediately following Carlyle's death, as the commencement indicates: 'On a cold wintry Monday morning in February the Times announced that Thomas Carlyle was seriously ill.
Dartington. Undated, but written before his father's death in 1859. 3pp., 12mo. Bifolium, on grey paper embossed with crest. In good condition, on lightly-aged paper, with slight damage to second leaf and with part of the paper to which it was attached still adhering to the blank reverse. He begins by declaring that he is 'much vexed' over a mix-up about a parcel of books 'I wrote expressly to London to desire that they might be sent here. As there is no help for it now I must beg you to believe it was not through carelessness of mine'. He asks her to send them on to Dartington, and to let him know the cost, which he will remit in postage stamps. Two pages, 12mo, letter inset into larger page, both sides visible, good condition. Masson has been introduced to a Mr J. Stuart Glennie by Professor Blackie, and talking about a matter of importance, in which he has also been seeking to interest Mr. Carlyle and others whom you know. It seems that a movement is in progress, & insuch a way as almost certainly to issue in success, for the establishment on Limited Liability principles of a new daily newspaper. At present the chief promoters of he paper are liberal & influential nonconformists; but Mr.
Autograph Letter Signed ('J A Froude') to Adolphus. 12 November [no year, but before 1863]. On embossed letterhead of 8 Clifton Place, Hyde Park, London. 12mo: 2 pp. Sixteen lines of text. Good. He is 'very anxious to be introduced' at the Literary Society and 'to take advantage of [Adolphus's] kindness in proposing' him. Gives reasons for not having attending any of the Society's dinners. Autograph ('A Helps') on order for copies of his 'Life of Las Casas' (1868). Undated (but post 1868); on Privy Council Office letterhead. 12mo: 1 p. Good, with four fold lines. Helps held the post of Clerk of the Privy Council from 1860 until his death. In large letters beneath the oval blue Privy Council crest reads 'Life of | Las Casas | 2 copies for | [signature] A Helps'. The handwriting is bold and the signature is underlined with a flourish.